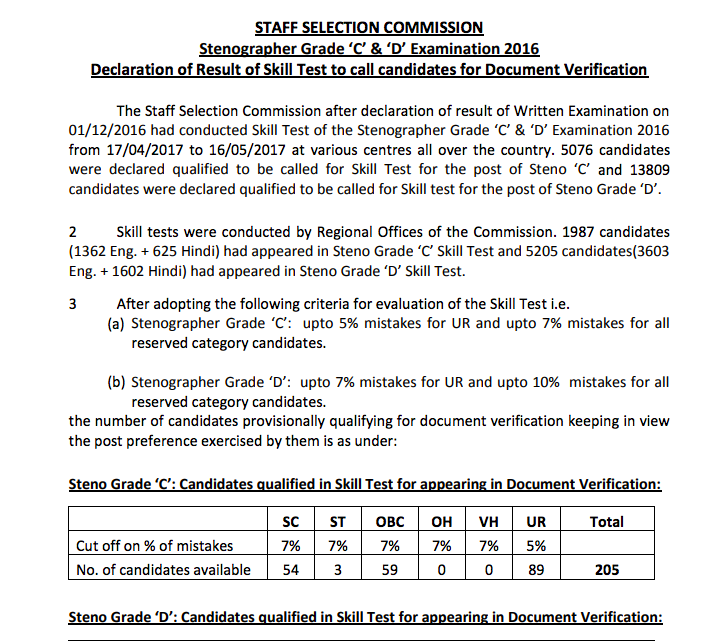 The Staff Selection Commission after declaration of result of written Examination on 01/12/2016 had conducted skill Test of the stenographer Grade ‘C’ & ‘D’ Examination 2016 from 17/04/2017 to 16/05/2017 at various centers all over the country. 5076 candidates were declared qualified to be called for skill test for the post of Steno ‘C’ and 13809 candidates were declared qualified to be called for skill test for the post of Steno Grade ‘D’. Skill test were conducted by Regional Office of the commission. 1987 candidates (1362 Eng. + 625 Hindi) had appeared in Steno Grade ‘C’ Skill Test and 5205 candidates (3603 Eng. + 1602 Hindi) had appeared in Steno Grade ‘D’ Skill Test.